Did I forget to blog in June? Honestly, it's been a whirlwind of stuff the past month. We sold our house, packed up everything we own into a 12x9 Pod, and embarked on homelessness for two weeks while we wait to close on our new place. I'm currently in the second week of homelessness, staying in a friend's basement and wearing the same outfit every day. The outfit you see here is one I managed to salvage from a suitcase and throw together for dinner with friends that were in town from Dallas. The hair isn't so much washed as it was "watered", but I passed for a fairly normal person that night at Sushi Cafe considering that mere hours earlier I was wearing an outfit for the third consecutive day: Gap yoga pants and a "Puppies Make Me Happy" tank top. We close on Friday. Just a few more days until I live out of boxes instead of a suitcase. Vest, c/o JustFab (exact - also comes in red!). Dress, Treasure & Bond via TrunkClub (exact - one of my favorite summer finds! Just trust me and buy it.). I love figuring out how to wear items in different settings. A pair of dress pants for a girls' night out, a slouchy casual top for date night, a classic LBD to the beach. Work to weekend has always been one of my favorite features on the blog, and since I've been wearing my favorite items more times and more places, it was time to bring it back. Today's challenge: These slouchy striped pants. They've got a cool vibe that I loved the second I put them on, and I could easily imagine them in a number of settings. Work, date night, beach...they felt like they could work every day. First up: How I wore them to work. This long trench flowing behind me when I walked made me feel way cooler than I actually am, and adding a bright top made my Monday feel much less blah-y. Pants, c/o JustFab. 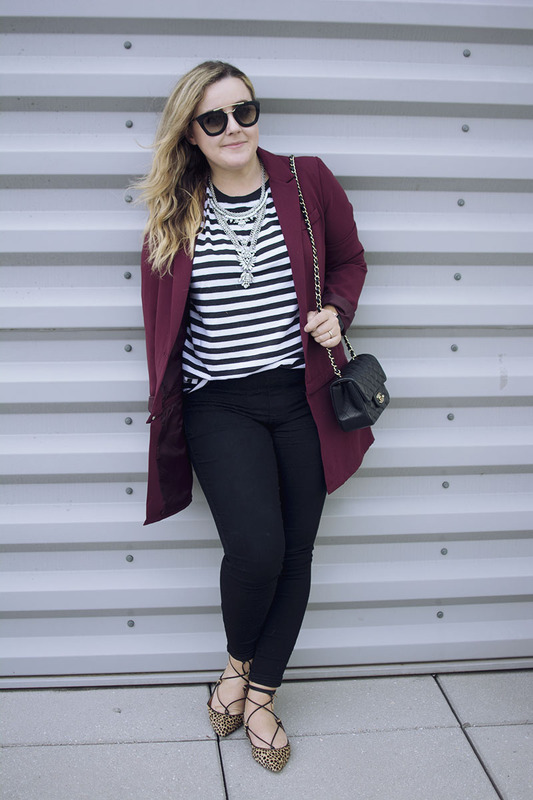 Trench, c/o JustFab. Bag, c/o JustFab. Top, J.Crew Factory (similar). Heels, Manolo Blahnik (similar). Fast-forward to the weekend, and I threw these pants on for brunching with my lady friends. It was a beautiful crisp day, perfect for a patio as long as you had a light sweater. Later that evening, I swapped my slide sandals for scrappy heels and wore a black silk tank and leather jacket. Date night. Boom. Pants, c/o JustFab. Shirt, Forever 21 (similar). Sweater, Forever 21 (similar). Sandals, Forever 21 (similar). Bag, Coach.